(Manama) – The Deputy King, His Royal Highness Prince Salman bin Hamad Al Khalifa, Crown Prince, met with the former King of Spain, His Majesty King Juan Carlos I. During the meeting, the Deputy King affirmed that relations between the Kingdom of Bahrain and the Kingdom of Spain are continuously progressing due to the joint commitment by both countries’ leaderships to reinforce collaboration across a number of sectors while expanding areas of common interest. The Deputy King welcomed King Juan Carlos I to the Kingdom and reviewed with him the close ties and various areas of collaboration between the two Kingdoms. The Deputy King expressed his appreciation for His Majesty King Juan Carlos I’s keenness to visit Bahrain, which reflects the joint commitment of both Kingdoms to develop cooperation at all levels. 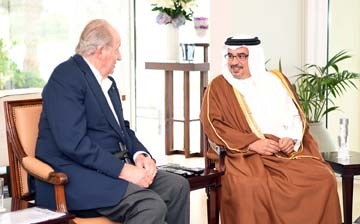 For his part, His Majesty King Juan Carlos I expressed his thanks and appreciation to the Deputy King for the warm welcome and hospitality he received during his visit to the Kingdom, praising His Royal Highness’ efforts in supporting bilateral relations, and wishing Bahrain further progress and prosperity.